The number of tourist attractions and things to do in Dubai has grown dramatically in recent years. Lounging around the hotel pool is no longer the only leisure option. The recent opening of the Dubai Mall and Downtown Dubai added a number of world class attractions to the city’s portfolio. The most striking is the 828 metre high Burj Khalifa, the world’s tallest building. Visitors can take a high speed lift to the At The Top observation deck on the 124th floor for unrivalled 360 degree views of the city. The Dubai Fountain is the world’s largest musical fountain. It’s free to watch but the best views are from the restaurants at the Souk Al Bahar and Dubai Mall. Other attractions at Dubai Mall include the Dubai Ice Rink, KidZania, and the Dubai Aquarium. 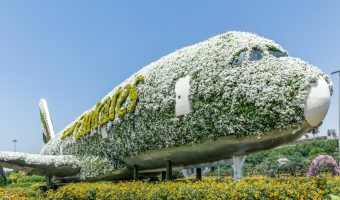 Elsewhere the city has even more attractions and activities that kids will enjoy. Options include waterparks such as Wild Wadi and Aquaventure, and the dolphin experiences at Dolphin Bay and the Dubai Dophinarium. Most of the larger shopping malls boast dedicated play areas (Magic Planet at Deira City Centre and Mall of the Emirates, Fun City at the Ibn Battuta Mall, Playnation at Mirdif City Centre, and Encounter Zone at Wafi Mall). Going to the movies is a popular activity, particularly with locals that avoid bars and clubs for religious reasons. Most of the city’s cinemas are located at shopping malls. 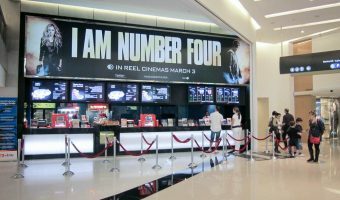 The biggest are the Grand Megaplex at the Ibn Battuta Mall and Reel Cinemas at the Dubai Mall. Dubai is a major destination for golfers and boasts a number of first class golf courses. Many of the top hotels offer tennis and squash courts. Driving experiences and karting are offered at the Dubai Autodrome. The city even boasts an indoor ski slope. Visitors with an interest in history and culture can wander around the fantastic Bastakia Quarter, visit the Heritage and Diving Villages, explore the Dubai Museum, or gain an insight into the Islamic religion on a tour of the Jumeirah Mosque. Exciting water park at the Atlantis resort. Observation deck at the world's tallest building. Sport and leisure club with a host of restaurants, a hotel, spa, and sporting facilities. One of the city’s most picturesque heritage sites. Swim with dolphins at the Atlantis resort. The home of motorsports in Dubai. Educational centre for children between two and fifteen years old. Entertaining dolphin shows in Creek Park. Spectalular dancing fountain outside the Dubai Mall. Large ice skating rink offering public skating sessions and classes. Offers a fascinating insight into the city’s heritage and culture. 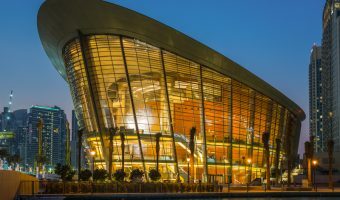 Performing arts venue at Downtown Dubai. Seasonal shopping and cultural event. Living museums where visitors can look back in time and explore Dubai’s past. One of the best public beaches in Dubai. The only mosque in the city that opens its doors to non-Muslims. Miniature city where children run the show. Large municipal park with picnic areas, sports facilities, and a small fairground. Offers thrilling sightseeing tours of Dubai. Indoor theme park with a range of adrenaline-pumping rides and games. Offers numerous tours and activities. Once the home of Sheikh Saeed Al Maktoum, ruler of Dubai between 1912 and 1958. Offers a variety of winter sports experiences. 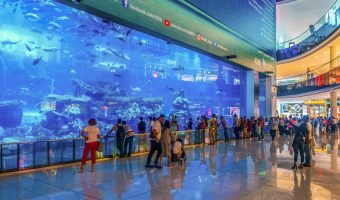 Take a break from shopping to visit the Dubai Mall's large aquarium. 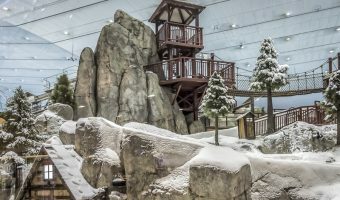 The first indoor ski resort in the Middle East. Impressive aquarium at the Dubai Mall. View for free from outside or pay to walk through the viewing tunnel.